New Term Extraction Features in InterpretBank and InterpretersHelp – Thumbs up! 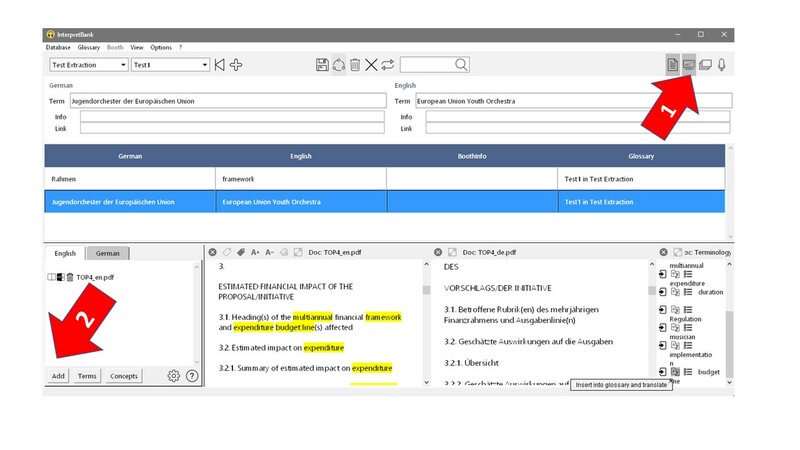 Extracting terminology from preparatory texts into a term database seems to be the hot topic of the moment, judging by what the two most active and innovative CAI (computer-assisted interpreting) tools, InterpretBank and InterpretersHelp, are working on at the moment. So while I am still waiting to become a Windows beta tester of Intragloss, the pioneer in this field, I am eager to have a go at both InterpretBank5’s (beta) and InterpretBank’s (experimental) new extraction features. InterpretBank by Claudio Fantinuoli has been adding quite some time-saving features for conference preparation lately. Apart from searching online ressources on the go while building your glossary, it now promises to extract terminology from your glossaries, view original and translation in parallel and link documents to glossaries. This does indeed sound like Intragloss combined with the sophisticated booth-friendly terminology management system that InterpretBank has been for many years. So off we go! As you can see in the picture, a new „documents“ icon has been added to the familiar three others (editing, conference mode, flashcards). When I press the magic button, the documents pane appears in the bottom left corner and lets me add documents like pdf or pptx in my two languages and display them next to each other. Unfortunately, there is no synchronised scrolling and no search function to look up word in the documents, but these functions are to be implemented soon. The selected documents are now linked to the glossary, so whenever this particular glossary is opened, they will appear in the documents pane. Highlighting words in the two texts and inserting them into the glossary or looking up translations in my favourite online resources (like IATE, Linguee, Pons, LEO and others more) works so swiftly, when I first tried it the terms were in my glossary before I had even noticed. Automatic extraction of terminology or key concepts so far only works for English, but will be implemented for other languages, too (German, Spanish, French and Italian are planned to be released in April). Quality of extraction, as always, depends on many factors, like the amount of text and the subject area, but it is good to get a first impression of the subject matter at hand. InterpretBank as a locally installed application raises no confidentiality issues with your client’s documents being opened and processed, as everything InterpretBank does happens on your computer (unless you use the „send document to any device“ option). If you are more of a team glossary and online networking person, InterpretersHelp by Yann Plancqueel and Benoît Werner is the other option to manage glossaries and manually extract terminology from texts. It is quite straightforward: Adding documents works via Copy & Paste, you just paste the text into a field for the respective language so you have the two language versions displayed next to each other (but with no synchronised scrolling either). When I tried it, inserting 20 pages from a pdf worked fine. 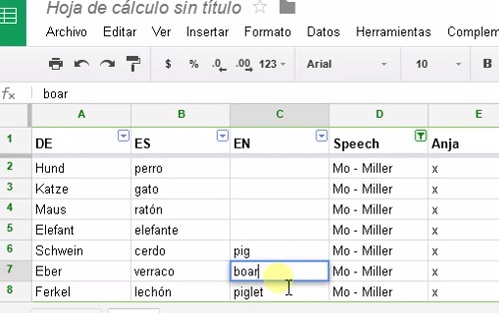 Words can be looked up in the texts using the browser search function. The highlighting and inserting also works very swiftly and you can look up terms in Google Translate and the Oxford Dictionaries. Once you have extracted all the vocab you need, you press a button to add all the new entries to your glossary. When changing back from the glossary view to the extractor, the texts have disappeared. InterpretersHelp as a cloud-based tool addresses the data protection issue by encrypting the data that transit to and from the website (https://interpretershelp.com/help/secure_hosting). Of course there are zillions of other functions interpreters need for CAI tools to support their workflow perfectly. But I think that both InterpretBank and InterpretersHelp have added one super useful feature to make our lives easier. Thanks a lot! Josh Goldsmith: The Interpreter’s Toolkit: Interpreters’ Help – a one-stop shop in the making?. In: aiic.net February 12, 2018. <http://aiic.net/p/8499>. Anja Rütten: InterpretBank 4 Review. 31 July 2017. <http://blog.sprachmanagement.net/interpretbank-4-review/>. Alexander Drechsel: App profile: Interpreters‘ Help. 2 Oct 2015. <https://www.adrechsel.de/dolmetschblog/interpretershelp>. Veröffentlicht am Februar 20, 2018 Februar 20, 2018 Kategorien Document Management, Software, Terminology ManagementSchlagwörter conference interpreting, conference preparation, interpretbank, interpreters help, term extraction, Terminology extraction1 Kommentar zu New Term Extraction Features in InterpretBank and InterpretersHelp – Thumbs up! [for German scroll down] What do you do when you receive 100 pages to read five minutes before the conference starts? Right, you throw the text into a machine and get out a list of technical terms that give you a rough overview of what it’s all about. Now finally, it looks like this dream has come true. OneClick Terms by SketchEngine is a browser-based (a big like) terminology extraction tool which works really swiftly. It has all it takes and nothing more (another big like): Upload – Settings – Results. Once you are logged in for your free trial, OneClickTerms accepts the formats tmx, xliff (2.x), pdf, doc(x), html, txt. The languages supported are Czech, German, English, Spanish, French, Italian, Japanese, Korean, Dutch, Polish, Portuguese, Russian, Slovak, Slovenian, Chinese Simplified, Chinese Traditional. It actually required rather four clicks than OneClick, but the result was worth the effort. There isn’t a lot of „noise“ (irrelevant terms) in the term candidate list, one of the reasons that often put me off in the past when I tried to use term extraction tools to prepare for an interpreting assignment. In the meeting where I tested OneClickTerms, at the end the only word I missed in the results was the regulatory scrutiny board. Interestingly, it was also missing from the list I had obtained from a German text on the same subject (Ausschuss für Regulierungskontrolle). But all the other relevant terms that popped up during the meeting were there. And what is more, by quickly scanning the extraction list in my target language, German, I could activate a lot of terminology I would otherwise definitely have had to think about twice while interpreting. So to me it definitely is a very efficient way of reducing the cognitive load in simultaneous interpreting. The results list can be downloaded as a txt file, but copy & paste into MS Excel, for example, works just as fine, plus it puts both single and multi words into the same column. After unmerging all cells the terms can easily be sorted by frequency, which makes your five-minute emergency preparation almost perfect (as perfect as a five-minute preparation can get, that is). 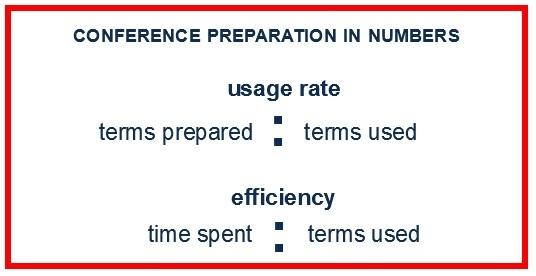 Furthermore, even if you do have enough time for preparation, extracting and scanning the terminology as a first step may help you to focus on the substance when reading the text afterwards. There is a free one month trial, after that the service can be subscribed to from 100 EUR/year (or 12.32 EUR/month) plus VAT. It includes many other features, like bilingual corpus building – but that’s a different story. Noch fünf Minuten bis zum Konferenzbeginn und ein hundertseitiges pdf zur Vorbereitung schneit (hoffentlich elektronisch) in die Kabine. Was macht man? Klar: Text in eine Maschine werfen, Knopf drücken, Terminologieliste wird ausgespuckt. Damit kann man sich dann zumindest einen groben Überblick verschaffen … Nun, es sieht so aus, als sei dieser Traum tatsächlich wahr geworden! 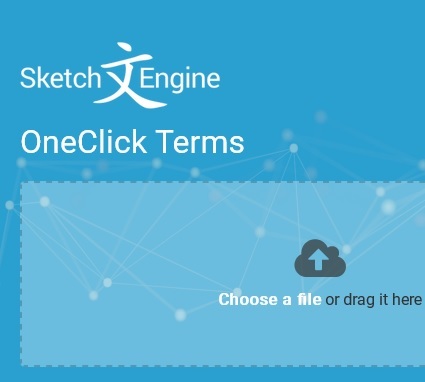 OneClick Terms von SketchEngine ist ein browser-basiertes (super!) Terminologieextraktionstool, das extrem einfach in der Handhabung ist. Es hat alles, was es braucht, und mehr auch nicht (ebenfalls super!). Upload – Einstellungen – Ergebnisse. Fertig. Wenn man sich mit seinem kostenlosen Testaccount eingewählt hat, kann man eine Datei im folgenden Format hochladen: tmx, xliff (2.x), pdf, doc(x), html, txt. Die unterstützten Sprachen sind Tschechisch, Deutsch, Englisch, Spanisch, Französisch, Italienisch, Japanisch, Koreanisch, Niederländisch, Polnisch, Portugiesisch, Russisch, Slowakisch, Slowenisch, Chinesisch vereinfacht und Chinesisch traditionell. Es waren zwar eher vier Klicks als EinKlick, aber das Ergebnis war die Mühe Wert. Es gab wenig Rauschen (irrelevante Termini) in der Termkandidatenliste, einer der Gründe, die mich bislang davon abgehalten haben, Terminologieextraktion beim Dolmetschen zu nutzen. In der Sitzung, bei der ich OneClickTerms getestet habe, fehlte mir am Ende in der Ergebnisliste nur ein einziger wichtiger Begriff aus der Sitzung, regulatory scrutiny board. Dieser Ausschuss für Regulierungskontrolle fehlte interessanterweise auch in der Extraktionsliste, die ich zum gleichen Thema anhand eines deutschen Textes erstellt hatte. Alle anderen relevanten Termini, die während der Sitzung verwendet wurden, fanden sich aber tatsächlich in der Liste. Und noch dazu hatte ich den Vorteil, dass ich nach kurzem Scannen der Liste auf Deutsch, meiner Zielsprache, sehr viele Terminie schon aktiviert hatte, nach denen die ich ansonsten während des Dolmetschens sicher länger in meinem Gedächtnis hätte kramen müssen. Für mich definitiv ein Beitrag zur kognitiven Entlastung beim Simultandolmetschen. Die Ergebnisliste kann man als txt-Datei herunterladen, aber Copy & Paste etwa in MS-Excel hinein funktioniert genauso gut. Man hat dann auch gleich die Einwort- und Mehrwort-Termini zusammen in einer Spalte. Wenn man den Zellenverbund aufhebt, kann man danach auch noch die Einträge bequem nach Häufigkeit sortieren. Damit ist die Fünf-Minuten-Notvorbereitung quasi perfekt (so perfekt, wie eine fünfminütige Vorbereitung eben sein kann). Aber selbst wenn man jede Menge Zeit für die Vorbereitung hat, kann es ganz hilfreich sein, bevor man einen Text liest, die vorkommende Terminologie einmal auf einen Blick gehabt zu haben. Mir zumindest hilft das dabei, mich beim Lesen stärker auf den Inhalt als auf bestimmte Wörter zu konzentrieren. Man kann OneClick Terms einen Monat lang kostenlos testen, danach gibt es das Abonnement ab 100,00 EUR/Jahr (oder 12,32 EUR/Monat) plus MWSt. Es umfasst noch eine ganze Reihe anderer Funktionen, etwa auch den Aufbau zweisprachiger Korpora – aber das ist dann wieder eine andere Geschichte. Maha El-Metwally has recently written a master’s thesis at the University of Geneva on preparation for conferences of international organisations using tablets. She is a freelance conference interpreter for Arabic A, English B, French and Dutch C domiciled in Birmingham. How come you know so much about the current preparation practice of conference interpreters at so many international institutions? The answer is quite simple really: I freelance for all of them! I am also pro paperless environments for obvious environmental and practical reasons. So even if some organisations offer a paper alternative (ILO, IMO, UNHQ, WFP) I go for the electronic version. Paperless portals of international organisations may differ in layout and how the information is organised but they essentially aim to achieve the same thing. Some organisations operate a dual document distribution system (paper and digital) with the aim of phasing out the former over time. The European Parliament is already on its second paperless meeting and document portal. It used to be called Pericles and now it is called MINA, the Meeting Information and Notes Application. This required a bit of practice to become familiar with the new features. I recently heard someone working in one of these paperless environments complain about the paperless approach, saying that they often struggle to find their way through a 400 pages document quickly. My first reaction was to say that hitting CTRL-F or CTRL-G is an efficient way to get to a certain part of a text quickly. But maybe there is more to it than just shortcuts. What is the reason, in your experience, that makes it difficult for colleagues to find their way around on a tablet or laptop computer? I think that tablets represent a change and people in general resist change. It could be that we are creatures of habit. We are used to a certain way of doing things and some of us may be having a difficulty coping with all the changes coming our way in terms of technology developments. It could also be that some interpreters do not see the point of technology so they are not motivated to change something that works for them. How is the acceptance of going paperless in general in the institutions you work for? This depends on individual preferences. Many colleagues still prefer paper documents but I also see more and more tablets appearing in the booths. Some organisations try to accommodate both preferences. The ILO operates a dual distribution system as a step towards going completely paperless. Meeting documents are available on the organisation’s portal but are also printed and distributed to the booths. The same goes for the IMO where the interpreters are given the choice of paper or electronic versions of the documents or both. Right, that’s what they do at SCIC, too. I take it that you wrote your master’s thesis about paperless preparation, is that right? Was the motivational aspect part of it? Or, speaking about motivation: What was your motivation at all to choose this subject? Yes, this is correct. I am very much of a technophile and anything technological interests me. I was inspired by a paperless preparation workshop I attended at the European Parliament. It made sense to me as a lot of the time, I have to prepare on the go. It happens that I start the week with one meeting then end the week with another. Carrying wads of paper around is not practical. Having all meeting documents electronically in one place is handy. It happens a lot that I receive meeting documents last minute. There is no time to print them. So I learned to read and annotate the documents on apps on my tablet. So while you personally basically did „learning by doing“, your researcher self tried to shed some more scientific light on the subject. Is that right? Would you like to describe a bit more in detail what your thesis was about and what you found was the most interesting outcome? My thesis looked at training conference interpreting students to prepare for conferences of international organisations with the use of tablets. I noticed from my own experience and from anecdotes of older colleagues that meetings were getting more and more compressed. As a result, especially in peak seasons, interpreters may start the week with one conference and end it with another. Preparation on the go became a necessity. In addition, there are several international organisations that are moving towards paperless environments. Therefore, I think it is important for students to be introduced to paperless preparation at an early stage in their training for it to become a second nature to them by the time they graduate. And what a better tool to do that than the tablet? I created a course to introduce students to exactly that. So when you looked at the question, was your conclusion that tablets are better suited than laptop computers? Currently, it seems to me that on the private market almost everyone uses laptops and at the EU, most people use tablets. I personally prefer a tablet for consecutive, but a laptop in the booth, as I can look at my term database, the internet and room documents at the same time more conveniently. I also blind-type much faster on a „real“ keyboard. I hope that the two devices will sooner or later merge into one (i.e. tablets with decent hard drives, processors and operating systems). Now, from your experience, which of the two option would you recommend to whom? Or would you say it should always be tablets? You have created a course for students. What is it you think students need to be taught? Don’t they come to the university well-prepared when it comes to handling computers or tablets? The current generation of students is tech savvy so they are more likely to embrace tablets and go fully digital. The course I put together for teaching preparation with tablets relies on the fact that students already know how to use tablets. The course introduces the students to paperless environments of a number of international organisations, it looks at apps for the annotation of different types of documents, glossary management, more efficient google search among other things. I also like to use the touchscreen of my laptop for typing when I want to avoid noise. But compared to blind-typing on a „normal“ keyboard, I find typing on a touchscreen a real pain. My impression is that when I cannot feel the keys under my fingers, I will never be able to learn how to type, especially blind-type, REALLY quickly and intuitively … Do you know of any way (an app, a technique) of improving typing skills on touchscreens? I’m afraid I don’t really have an answer to that question. I am moving more and more towards dictating my messages instead of typing them and I am often flabbergasted at how good the output is, even in Arabic! Talking about Arabic, is there any difference when working with different programs in Arabic? Most of the time, I can easily use Arabic in different apps. The biggest exception is Microsoft Office on Mac. Arabic goes berserk there! I have to resort to Pages or TextEdit then. Having said that, a colleague just mentioned yesterday that this issue has been dealt with. But I have to explore it. As to glossary management, not all terminology management tools for interpreters run on tablets. Which one(s) do you recommend to your students or to colleagues? I use and recommend Interplex. It has a very good iPad version. 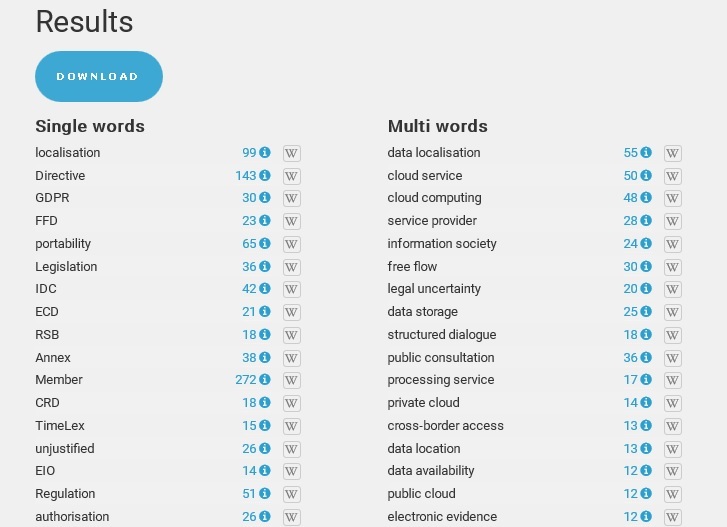 The feature I like most about it is that you can search across your glossaries. I can do that while working and it can be a life saver sometimes! If I wanted to participate in your seminar, where could I do that? Do you also do webinars? I offer a number of seminars on technology for interpreters to conference interpreting students at some UK universities. I will keep you posted. I also have an upcoming eCPD webinar on September 19th on a hybrid mode of interpreting that combines the consecutive and simultaneous modes. That sound like a great subject to talk about next time! Man spart Zeit, vor allem, wenn zunächst einmal alle ihre Termini ohne Entsprechungen eingeben und man die anderssprachigen Lücken in Teamarbeit ausfüllt, sprich jeder füllt zunächst die Lücken (der anderen), die er in seinem Wissensbestand ohnehin abrufbar hat. Fehler werden vermieden (Vier-Augen-Prinzip). Das gesamte Team hat den gleichen Wissensstand, alle sprechen „die gleiche Sprache“ und wissen auch um eventuell noch offene Fragen, die mit dem Kunden/Teilnehmern der Veranstaltung noch zu klären sind. (hierzu auch Leonies Beitrag im AIIC Blog). Hinzu kommt bei sehr dichten Fachkonferenzen, dass man sich die Vorträge häufig aufteilt. In einem gemeinsamen Glossar hat dabei dennoch jeder Zugriff auf die Terminologie zu den jeweils anderen Vorträgen und kann darauf zumindest einmal einen Blick werfen und zur Not auch einspringen. Abgesehen davon ist es einfach unterhaltsam und motivierend, sich „im Glossar zu treffen“ und live zu sehen, dass die Kollegen gerade auch dort herumhüpfen das Glossar wie von Geisterhand wächst. Und wie wir ja wissen, gibt es kaum etwas Besseres für eine tiefe Verarbeitung von Wissen als das Besprechen – hier vielleich eher „bechatten“. Trotz dieser Litanei an Vorteilen begegnen aber viele Kollegen immer noch verhalten, wenn es darum geht, sich auf ein gemeinsames Online-Megaglossar einzulassen, und zwar teilweise zu recht. Oft ist es nur Gewohnheits- oder Geschmackssache, aber einige konkretere Vorbehalte habe ich im Folgenden zusammengestellt und versucht zu beantworten. Kann ich vertrauliche Kundendaten der Cloud bzw. Google anvertrauen? Zunächst einmal ist das Speichern bei Google (vorausgesetzt, man stellt die Daten nicht öffentlich) an sich nicht unsicherer als der Versand per E-Mail – bis auf die Tatsache, dass Google theoretisch „mitliest“. Grundsätzlich empfiehlt sich, Dateien nicht unbedingt nach dem Muster „XY AG – Vorstellung des neuen Glasreinigerpatents am 1.8.2015“, sondern eher „Reiniger“zu nennen und vor allem im Zweifel den Kunden vorher zu fragen. Eine weitere Lösung ist das Verwenden einer Verschlüsselungssoftware wie https://www.boxcryptor.com. Mir ist so ein Riesenglossar viel zu unübersichtlich, ich weiß überhaupt nicht, was wo steht. Wie in einer normalen Terminologiedatenbank auch, steht und fällt der Wert eines Gemeinschaftsglossars auch mit der Aussagekraft seiner „Tags“, also Kategorisierungen. Gibt es mehrere Parallel-Teams, Konferenztage, Redner oder Themenbereiche, so empfiehlt es sich, dafür jeweils eine eigene Spalte zur Kennzeichnung anzulegen. Auch eine Kombination der Kriterien ist möglich, etwa Konferenztag und Redner in einer Spalte nach dem Muster „Mo – Schmidt, Mo – Müller, Di – Meier“. Der Mehraufwand ist nicht der Rede wert: Einmal getippt, kann man die entsprechende Kennung in die nächsten Zeilen einfach mit der Maus herunterziehen/-kopieren. So hat man dann gleich die nächsten Zeilen für die eigenen Einträge „reserviert“ und die Kollegen räumen ihre Einträge erst darunter ein. Wenn man Filter und Kategorien geschickt einsetzt, kann jeder Nutzer sich mühelos seine eigene persönliche Teilansicht des großen Teamglossars erstellen – hier findet Ihr auch ein zweiminütiges Erklär-VIDEO. Es hat doch jeder seine eigenen wichtigen Termini. Kollegen schreiben oft Dinge ins Glossar, die mich gar nicht interessieren, und umgekehrt schreibe ich mir vielleicht Sachen auf, die andere lächerlich finden, aus Sorge, sie im Eifer des Dolmetschgefechts nicht abrufbar zu haben. Hier bietet es sich an, jedem Teilnehmer eine „private“ Spalte zuzuweisen, in der er das markieren kann, was für ihn persönlich relevant ist oder zum Beispiel auf eine Kurzliste gehört. Die kann man sich dann für den eigenen Bedarf herausfiltern und womöglich sogar ausdrucken. Ganz abgesehen davon ist es hochinteressant zu sehen, wie fast schon lachhaft ähnlich sich die Aufzeichnungen unterschiedlicher Kollegen doch oft sind. Wenn ich während des Arbeitens z.B. die Sprachen ausblende, die ich nicht brauche, oder nach einem bestimmten Redner filtere, können andere auf die ausgeblendeten Informationen nicht zugreifen. Wenn ich z. B. nach der Spalte „Deutsch“ sortiere, um nach Doubletten zu suchen, wird die ganze Reihenfolge durcheinandergeschmissen und jemand, der eigentlich gerade die Termini zu einem bestimmten Votrag eingeben wollte, ist völlig verwirrt. Wenn wirklich viele Leute gleichzeitig in einem Glossar arbeiten, kann es praktisch sein, für die eigene Dateingabe oder für spezielle Sortierungen/Filterungen ein separates Datenblatt zu nutzen. Wenn die Tabellenstruktur identisch ist, kann man dort in Ruhe seine eigenen Einträge anlegen und diese dann nachher in das Gemeinschaftsglossar hineinkopieren, z.B. jedes Mal, wenn man einen Themenbereich oder einen Vortrag fertig bearbeitet hat. Dabei kann man dann auch störende Spalten ausblenden. Es gibt auch eine große Auswahl von add-ons, die das Arbeiten mit großen Datenmengen erleichtern. So kann man mit EZ Query ein neues Datenblatt erstellen, das ähnlich einer Abfrage in MS-Acces ein Abbild der großen Gesamtdatenbank erstellt, in dem nur die Spalten gezeigt werden, die mich interessieren. Wenn ich bspw. in einem Team mit 10 Sprachen bin, kann ich für die Abfrage in der Kabine meine persönliche Ansicht zum Durchsuchen wählen, in der nur meine Sprachen und meine als relevant gekennzeichneten Einträge sichtbar sind. Wenn jemand in der Haupttabelle etwas ändert, sehe ich es in meiner personalisierten Ansicht auch in Echtzeit. Insgesamt überwiegen meiner Einschätzung nach die Chancen dieser Form der Zusammenarbeit, um bei immer fachlicheren Konferenzinhalten und immer knapperen Vorlaufzeiten weiter auf hohem Niveau areiten zu können. Mich würde sehr interessieren, wie die gängige Praxis bei anderen Kollegen aussieht – ich freue mich auf Kommentare! When, back in 2012, our colleague Leonie Wagener conducted a survey on preparatory terminology work in conference interpreting, 93 % of the respondents answered that they never used Google Docs for terminology management in the booth. Today, it seems, team preparation in the cloud by way of a shared mega-glossary is about to become state of the art. The benefits are quite clear: It saves time – your colleagues may know things you don’t know and the other way around, and with everyone feeding in their knowledge and filling in the missing bits, it’s just much less effort. Everything is double (triple …) checked and mistakes can be spotted more easily. The whole team has a common knowledge base, all interpreters speak the same language and everyone is aware of any open questions waiting to be sorted out (also see Leonie’s AIIC blog article). Furthermore, you have these highly technical conferences crammed with presentations where the only way to get through preparation is by assigning to each interpreter his or her share of speeches. By working in a common glossary, you can still make sure that everyone gets at least a glimpse of what the other speeches are about so as to be able to jump in if need be. Apart from that, it is good fun to see your glossary grow as if by magic and to „meet in the glossary“, seeing your colleagues jump about from one cell to the other. And then of course, there is nothing better than discussing things in order to really understand them and process them deeply, which is exactly what you end up doing when working in a common file, using the chat function or simply a comment field. Is it safe to store my customers‘ confidential data in the cloud or with Google? First of all, storing files in Google Docs (provided you don’t store them publicly, but with restricted access) is as safe as sending them around by e-mail – apart from the fact that Google can read your data. We know that some customers even refuse to send their files to a gmail address, so in any case it is good to double-check with them. Also, it is a good idea not to name your files „XY Corp. – Presentation of the new glass cleaning patent on August 1st, 2015“, but rather make it „cleaning“ or „glass“. Another possible solution might be the use of special encryption software like https://www.boxcryptor.com. You get lost so easily in these huge glossaries, I just can’t find my way around there. I prefer to see what I need at one glance. Just like in any (terminology) data base, the more „tags“ (labels) each entry has, the more useful becomes the data base. If, on your three-day, six-language conference, there are several teams working in parallel with many speakers or subjects in each session, then it may be useful to use special columns to indicate the day/speaker/session/subject, or a combination thereof (like „Monday – Miller, Tuesday – Matt“). Technically, the effort is not worth mentioning: Once you have typed this kind of category in one cell, simply drag & copy it to all the cells below in the same column. This way, you can „reserve“ the next couple of lines for your entries and the colleagues use those further below. The smart use of categories and filters is not too complicated and helps everyone to create their own customised view of the big master glossary – here’s a 2 minute VIDEO to illustrate it. Each of us has their own important terms-to-remember. My colleague writes things into her glossary I would never dream of noting down, and I am sure that she would laugh at the ridiculous things I put into mine, just for the sake of feeling safer. It may turn out useful to have an individual „private“ column for each user where they are free to mark any terms that are relevant to them (or open questions etc.) to enable everyone in the team to filter their customised shortlists and even print them. The one thing to really laugh about is to see how much the glossaries of different colleagues for the same conference can look alike. What with all this hiding, sorting and filtering, my colleagues will freak out if, while they are just busy entering terms, I start hiding their language columns, applying filters or changing the sorting order right under their noses. When there are really many people working on the glossary at the same time, it may be useful, in order to avoid confusing other users when sorting or filtering, to temporarily copy the data from the „master“ sheet to a separate one. You might also wish to enter new terms for one speech in your private sheet first (e.g. hiding the language columns you don’t want to see) and then copy this batch to the big master glossary in one go. Just always make sure you have identical table structures so that you can copy your terminological entries (lines) back and forth from your personal sheet into the master glossary, which is the one where you keep all the data up to date. There are also a great many add-ons that allow you to work with complex team glossaries more comfortably. With EZ Query, for example, you create a new sheet that, just like a query in MS-Access, shows a pre-defined selection of the data contained in the big master table. You can include just the columns you are interested in (e.g. hiding language or other columns irrelevant to you) and even filter for certain criteria, like only those entries you have marked as important. As soon as someone changes something in the master table, you will see it in your customised table in real time. All in all, much more chances than risks to keep up with ever more specific conference subjects and short-notice preparation. I would be really interested to know more about the common practice of other colleagues – feel free to post a comment!